Putting together a beauty kit when you‘re away from home can be challenging because you need to travel light, have products that are multipurpose, and most importantly you can trust to work. I used to work away from home at least once a week, and so I would adapt my beauty kit depending on where I was going, and how long I’d be away. If you are on business, you need to ensure you have products you trust, and if you’re on holiday you can relax a bit, and as long as you have a good cleanser, and sunscreen you’ll survive! A 30 ml tube of high end foaming cleanser (I used Origins GinZing, and Shiseido Ibuki) lasts just over 3 weeks using it twice a day. However, not all high end brands are as concentrated, and found Clarins and Elemis needed more product to work effectively. That means each week about 10 ml of cleanser is used, and so a 125 ml tube lasts about 3 months on average. This gives you an idea of how much you will need when you go away, because you don’t want to run out! 5 ml tube of foaming cleanser used twice a day should last 2 to 4 days. 15 ml tube of foaming cleanser used twice a day should last up to 10 to 14 days. 30 ml tube of foaming cleanser used twice a day should last 3 weeks to a month. In general non-foaming cleansers such as creams or lotions (including micellar water) will use double the amount as compared above. Personally I prefer to take a small pack of facial wipes to remove makeup as they are quick and are easy to pack and reseal rather than take another cleanser with me. 5 ml tube of cleanser (non-foaming) used twice a day lasts 2 to 3 days. 15 ml tube of cleanser (non foaming) used twice a day lasts up to a week. 30 ml tube of cleanser (non-foaming) used twice a week can last up to two weeks. I know we are should all cut down on plastic, but when you’re traveling I wouldn’t take glass bottles unless they are reinforced and you have no choice. Glass bottles can smash, and they’re also heavy, and if you traveling with hand luggage only, every ounce counts. I’ve traveled around Asia with a 35L backpack and learned you have to make the most of every item you choose to carry. That means using an all in one body wash and shampoo, body cream that also works as after sun, and moisturizers or cleansers that double up as masks. I prefer to use tubes because they are easier to carry around and use if you have limited space (for example if you are in a hostel or camping), and flip top lids are ideal. Bottles and tubes can and do leak, so do double check the lids are tight when you pack them, and always put your beauty bag in a plastic bag in case. I’ve had a few leaks and explosions and was grateful I used a plastic bag for the items otherwise it would have been a lot messier. I try and keep good sized plastic bottles to refill, but always make sure you wash them out after using them, and if you refill it with a different product label it just in case you forget! One item you must never skimp on is your SPF for the face. I use SPF50 and carry a 50 ml tube with me regardless, as it’s better safe than sorry. It’s one product you can’t afford to run out of and there is no substitute for. I’m not usually a fan of facial wipes, but when you’re traveling they are a must as they are handy for a quick cleanse especially if you don’t have access to water. Finding a lip balm with sun protection is much easier these days, and your lips can burn so invest in one and remember to reapply regularly. The important thing is to travel as light as possible, especially if you are only taking hand luggage. 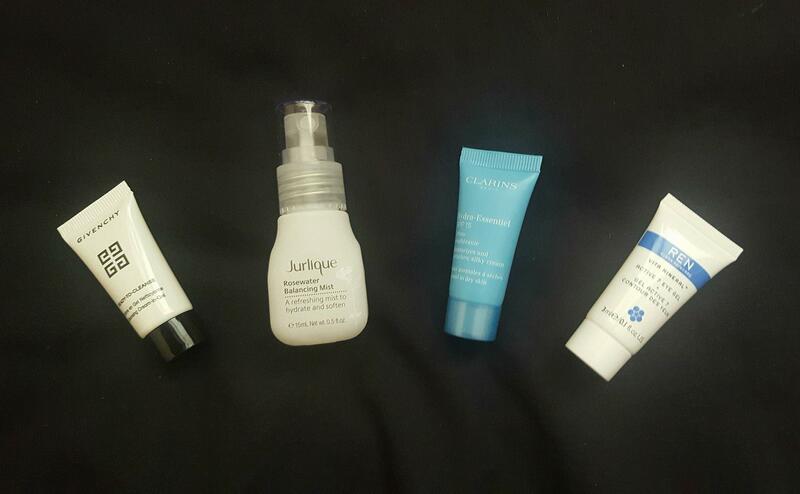 I find 3 ml tubes of eye cream/gel can last up to 5 days, and 5 ml tubes of foaming cleansers or moisturizers can last 3 or 4 days. For removing makeup I use face wipes, and usually keep a pack that is half used for traveling. Instead of taking a serum (you can skip a day or two), I tend to double up and use the eye cream/gel as a serum for the neck or other areas of concern because the product is geared towards firming. For a toner I have a small refillable bottle that I fill with rosewater that I use, which saves on taking cotton wool and can also be used as a tonic during the day if it’s hot or humid. This kit can last just over two weeks (about 17 days at a push), and as I advocate using a mask weekly I try to take an overnight mask, which is also good for traveling on planes or on long journeys where the skin can get dehydrated quickly. 15 ml Nuxe cleanser which is enough for a couple of weeks, but if I am running low I use my facial wipes in the morning and keep the cleanser for the evening when you need a little bit more help to deep cleanse the skin. 30 ml mild tonic from DHC (keep a similar sized bottle and refill with your usual toner). 15 ml 3 in 1 Vine Activ moisturizer from Caudalie that can be used day and night. 5 ml Clarins Eye Mask which lasts a fortnight; I use it three times a week at night only. Origins Drink Up Mask, which is an overnight hydrating mask, which is easy and quick to apply and delivers superb results. If you regularly exfoliate you can skip a week as long as you double cleanse properly. If you use a chemical exfoliator like a glycolic lotion or pads, then you don’t need to exfoliate, and it’s best only to use these in the evening due as exposure to the sun after using glycolic acid can lead to photosensitivity. 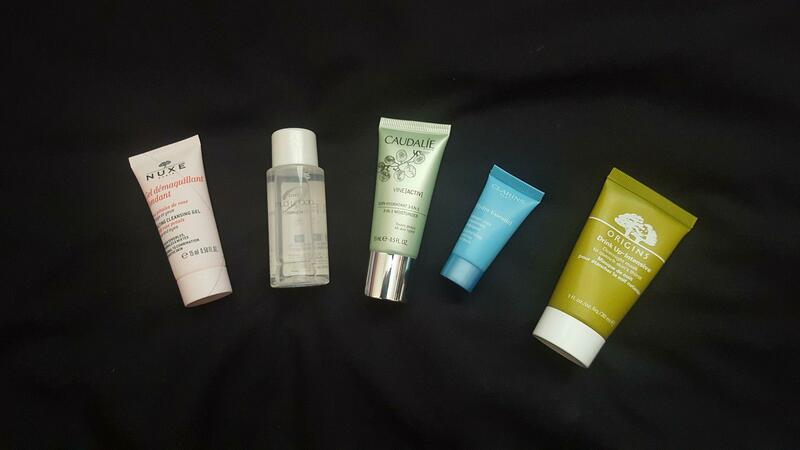 When you are away from home you need to take tried and tested products with you that travel well, and are compact to pack. With this kit I have included products that are guaranteed to work, that are portable, and take up very little room. Omorovicza Cleansing Foam (30 ml) is a new find for me, and a small amount really does go a long way, and this tube will last you a whole month. Darphin Intral Toner (50 ml) is enough for a month and is ideal for sensitive skins so if you do get any sunburn it will be soothing. Origins Willowherb Renewal Serum (15 ml) which is a light serum that will last a month if not longer. Elemis Pro-Collagen Marine Cream SPF 30 (15 ml) ~ A months supply of a hard working day cream with added SPF. Caudalie Vin Activ Eye Cream (5 ml) and Clarins Hydra-Essentiel Moisturizing Reviving Eye Mask (5 ml), use the cream during the day and the eye mask at night. DHC Face Wash Powder (50 g) ~ This is great as a gentle exfoliator and packaged in a plastic container is easy to carry around. Resultime Hydrating Cream (15 ml) ~ Ideal to use at night and is also good to repair skin, which is handy if you get any reactions or if your skin changes due to the change in temperature or environment when you travel. I can’t tell you how much this product has saved my skin at times, and it works within a day! 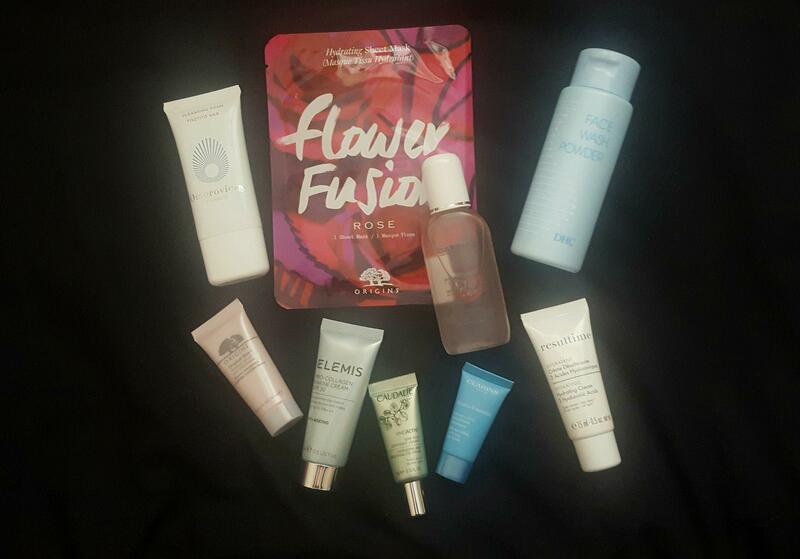 Origins Flower Fusion Sheet Mask ~ Take a couple of your favorite sheet masks and as they are soaked in serum, it can double up to save you using a serum. Golden Cup Balm is from Thailand is is good for insect bites and headaches. 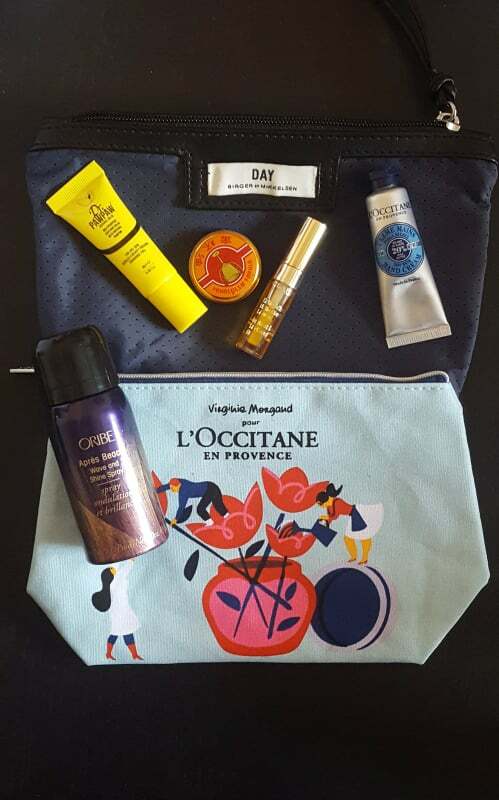 Hand cream ~ L’Occitane is a favorite, and is useful after using hand sanitizer during the day which can dry out the skin. Lip balm or oil ~ Keeping your lips hydrated is important because they can burn and dry out when you are out and about. A small pack of travel wipes, to refresh your hands, face, or neck. Having lived in some humid climates where there is no air conditioning these are a necessity. 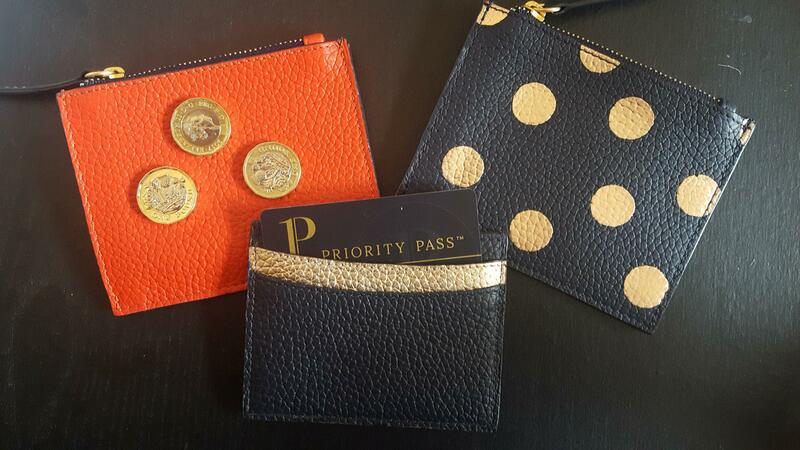 I also take with me two coin purses when I go abroad to keep small change separate from home currency. I also a cardholder, and take only what is necessary with me and you can usually squeeze in a folded note as emergency money. This is much better than carrying around a full purse, and is also handy for contactless payments/ tickets and saves you having to get your card out each time. These are from Boden who have some a selection of pouches and purses that vary seasonally. You really don’t need to take your whole beauty cabinet with you when you travel; choose wisely and make sure those lids are tight before you zip up your bag.